Donald Trump personally overrode intelligence experts to grant his daughter Ivanka Trump and son-in-law Jared Kushner top-secret security clearance last year. Kushner could be passing top secret U.S. intelligence to foreign officials — and that's exactly the huge national security risk that risk specialists were afraid of when they recommended they be DENIED top secret clearance. But the White House gave it to him anyway. Now we know why — because Donald Trump ordered them to! We cannot allow this. 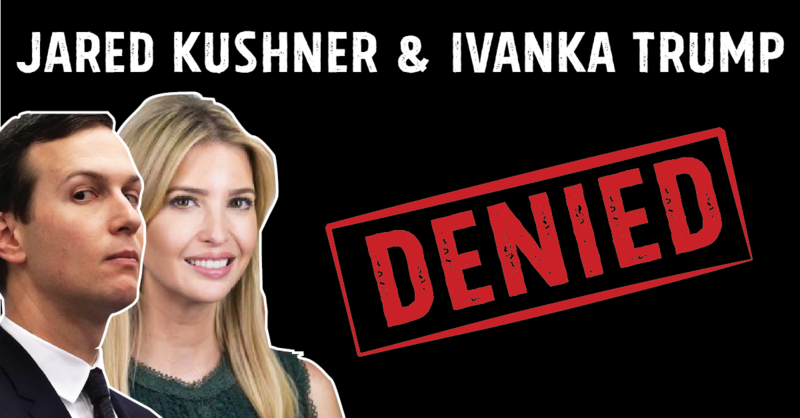 Add your name if you agree: Revoke Jared Kushner & Ivanka Trump’s security clearance! Independent analysts said Jared Kushner and Ivanka Trump’s security clearance could be a risk to national security. They should never have been overruled. We demand you immediately revoke Jared Kushner and Ivanka Trump’s inappropriately granted security clearance.